French for lay is the verb 'pondre'- Learn All the Tenses. The verb in French for lay is the Regular re verb pondre. 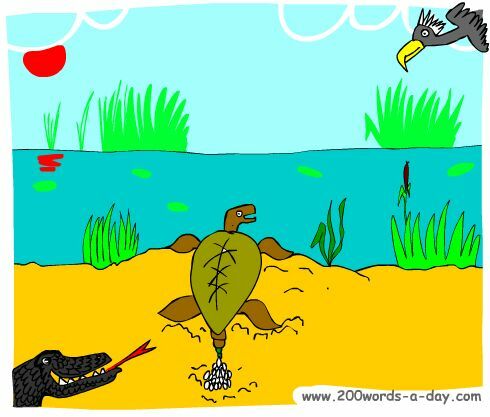 To remember this imagine: a turtle LAYS eggs beside the POND. Imagine a turtle LAYS eggs beside the POND..
Il faut mettre les poules au chaud pour qu'elles pondent. (subjonctif): Chickens must be placed in a warm place to lay their eggs. The French verb for lay pondre is a Regular RE verb conjugated using the same pattern of endings as almost 100 other Regular RE verbs. Learn to conjugate pondre and it will reinforce the pattern for ALL Regular RE verbs, these being the 3rd French regular common verb pattern. Do a series of RE verbs every day for a month and you will have a solid knowledge of the RE verbs' conjugation patterns. Keep doing them with a new one every day from the French Verbs List. ✔ You can more easily remember words and verbs like the French for lay pondre using the techniques of the world's Memory Masters. 200 Words a Day! Free Daily French Lesson Online - the verb in French for lay pondre - fully conjugated. French Learning Made Fun and Fast with your free newsletter Verb Lesson - pondre - the French for lay.